Supply of apples, pears, and grapes have been constrained from the US to China in recent months and are projected to continue during the 2018/19 season. According to a USDA Gain report, the US fruit items are expected to lose market share in China despite adverse weather events in China’s apple and pear growing regions. Production of Chinese apples is forecast to drop 25 per cent, to 31m tonnes, pears 20 per cent to 13m tonnes, and table grapes 10 per cent to 945,000 tonnes. Imports of apples are forecast to increase 10 per cent in 2018/19 season, made up by competitor suppliers to the US like Poland and France. New Zealand and Chile are expected to fill the Southern Hemisphere supply gap, further infringing on US market share. The Netherlands and Belgium are expected to fill the US supply gap for fresh pears. For table grapes, the US has no other apparent competitor, so import volumes are forecast to decrease by 7 per cent despite an expected increase from Southern Hemisphere suppliers. 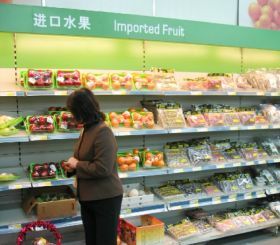 Consumption of fresh fruit is reportedly steadily growing in China, as the items become a core part of citizens’ daily diets. An increased focus on health, improved availability and selection are said to be contributing factors. 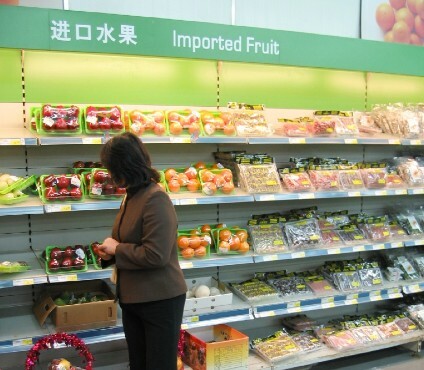 In 2017, China’s per capita fruit consumption was estimated at 92.5kg, and is expected to increase to 97.9kg by 2020, according to the China Agricultural Outlook Report (2018-2027). Due to the emergence of other domestically-produced fruit like lychees, grapes, cherries, and imported varieties like dragonfruit, mangoes, and durian, consumption of domestic apples and pears has shown signs of slowing. Continuing expansion of cold storage facilities means the supply season is predicted to see an extension, however, high-quality apples and pears are in short supply and are aggressively sought after by China’s consumers. Premium quality apples account for only around 30 per cent of China’s production.